Surely suffragists in the North would run from this theme, but many found it acceptable. For one thing, they resented the fact that their husbands and sons had fought a Civil War to give the vote to black males while ignoring the disenfranchisement of their wives and mothers. Second, they were convinced that their vote would be an important corrective to cultural dilution of the voting pool, even benefiting blacks. Third, they were pragmatic. 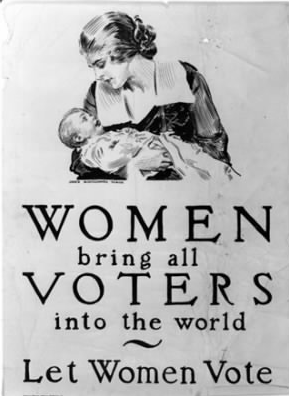 In 1920, the suffragist movement succeeded; the 19th Amendment gave women the vote. Of course, this was a wonderful achievement, thoroughly consonant with the biblical teaching on the dignity and wisdom of women. Not so wonderful was the way in which many American suffragists played upon the racial prejudice of the populace. While Elizabeth Cady Stanton and Susan B. Anthony have been honored rightly on U.S. stamps and Anthony on U.S. coinage, their legacy is stained somewhat, because their crusade for the 19th Amendment stooped to unsavory measures. They should have known that ends do not justify immoral means. [i] Henry B. Blackwell, “Address to NAWSA Convention, Atlanta, Georgia, January 31-February 5, 1895,” in The Concise History of Woman Suffrage: Selections from the Classic Work of Stanton, Anthony, Gage, and Harper, eds. Mari Jo and Paul Buhle (Urbana: University of Illinois Press, 1978), 337. [ii] Ann Douglas, Terrible Honesty: Mongrel Manhattan in the 1920s (New York: Farrar, Straus and Giroux, 1995), 254-255. [v] Belle Kearney of Mississippi, speaking at the NAWSA convention in New Orleans, March, 1903. Quoted in Aileen S. Kraditor, The Ideas of the Woman Suffrage Movement: 1890-1920 (New York: Columbia University Press, 1965), 202. [ix] One Woman, One Vote: Rediscovering the Woman Suffrage Movement, edited by Marjorie Spruill Wheeler (Troutdale, OR: NewSage Press, 1995), 69-70.